Asheville has been ranked in the Top 50 of Best Places to live for a few years now and and was listed as the #1 Coziest Cities in America by Elle DECORE magazine. Asheville area is world renowned as a bustling tourist destination, named one of twelve must-see travel destinations in the world by Frommer’s travel guides. The Asheville Yoga Center has really helped to put Asheville on the yoga map. Asheville has more art deco architecture than any other city outside of Miami. If shopping is your thing, check out the local crafts at the Folk Art Center on the Blue Ridge Parkway, just outside of downtown. Many of the craftspeople offer demonstrations and are happy to talk about their craft. Biltmore Village is another shopping destination that can’t be missed. Located right outside the entrance to Biltmore, America’s largest home and most visited winery, the Village has tree-lined streets, al-fresco dining and cobblestone paths. There are plenty of historic homes made into bed and breakfasts in Montford, just outside of downtown Asheville. Book a stay, or arrange for a tour of the neighborhood and the magnificent historic homes. 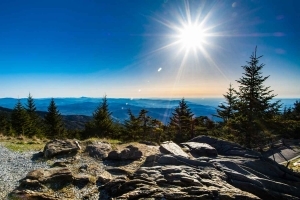 Mountain adventures await your visit to the Asheville area, whether you’re planning a culinary travel experience with a tour of restaurants and microbreweries, or if you’re checking out the area’s top-rated outdoor sports activities. There’s so much to see and do in Asheville, that the only problem is narrowing the options!